Akita International University is now accepting applications from non-degree-seeking students and auditors for 2019 Admissions. These students will take courses at AIU along with degree-seeking students. Non-Degree-Seeking Students: These students are not degree-seeking students, but take a few courses and receive credits for them. Auditors: These students are non degree-seeking students, but take a few courses for which they do not receive credits. For courses open to non degree-seeking students and auditors, please see the Course Offerings . ※ Non-degree-seeking students and auditors may not register for courses with the following codes: EAP (English for Academic Purposes), JPL (Japanese Language), ENG 100, 101, 120, 150, CCS 100-215, and courses noted as "Degree-Seeking Students only" on Course Schedule. ※ Some courses have limited capacity (Cap). Degree-seeking students are given priority, so non degree-seeking students and auditors may not take courses which have reached their capacity. ※ If the number of students who register for a course is below five, the course may be cancelled. ※ The Class Schedule is subject to change. Please check the latest version . ※ For more information on each course, please see the syllabus . ※ For information on important dates, please see the academic calendar . Applicants must meet one of the requirements 1) to 7) and both 8) and 9). 1) Have completed a high school or equivalent secondary education. 2) Have completed 12 years of regular pre-college education. 3) Have completed 12 years of regular pre-college education abroad or the equivalent as designated by the Minister of Education, Culture, Sports, Science and Technology of Japan. 4) Have completed education at a designated secondary education-equivalent institution as accredited by the Minister of Education. 5) Be officially designated by the Ministry of Education. 6) Have passed the University Entrance Qualification Examination administered by the Minister of Education as designated in the University Entrance Examination Regulations or have passed the High School Equivalency Examination administered by the Minister of Education as designated in the High School Equivalency Regulations. 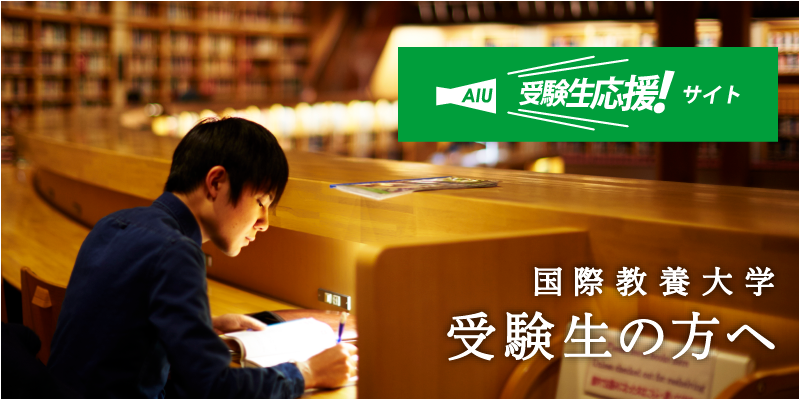 7) Be considered by the AIU President to possess equal or higher academic ability of the high school graduates studying at AIU and to have sufficient ability to complete the courses for which they intend to register. 8) Have sufficient English ability to complete courses. English ability equivalent to TOEFL iBT 61 points, TOEIC 700 points　or STEP EIKEN Pre-1 level is necessary. 9) Be able to attend all classes for the course. 1) Have sufficient English ability to complete courses. English ability equivalent to TOEFL iBT® 61 points, TOEIC® 700 points or STEP EIKEN Pre-1 level is necessary. 2) Be able to attend all classes for the course. 2) Verification of English Language Proficiency which must be valid at the time of the application deadline. Please bring the payment of JPY9,800 to your interview in the form of a postal money order （普通為替証書）. Applicants will be informed of the specific date and time at a later date. AIU’s classes have a low student-to-teacher ratio and in most courses students are expected to contribute significantly to the class. Most courses have an assignment for every class, requiring an extensive out-of-class time commitment. The conditions of study for non-degree-seeking students and auditors are the same as degree-seeking students and only those who are willing to study in this style should apply. If it is judged that a student’s absences or failure to complete out-of-class work makes it difficult for him/her to complete the class, or that it is negatively affecting other students, the student may be removed from the class.